This is something we are all told to do practically from birth. Strive for more, better and different. Inspiration is fueled by those different thinking people who for lack of a better phrase, just do it their own way. Take David Ash as an example. An indie filmmaker who strives to be remembered for breaking the mold that have become the movies we love. The big studios survive on rehashing tired ideas. Playing on a movie goers taste for the familiar. Mr. Ash wanted something different. His own story complete with his own vision. A true independent filmmaker. On one hand, "Twin Cities" is an ambitious production. Something akin to 2001's "Vanilla Sky" with it's mind blowing narration. A film to talk about around the water cooler at work, and sing high praises for within the indie community. On the other hand, what the movie going public actually ends up with contains a lot less flash and dazzle. Something to think about simply because you want to be sure you got it all right. The story of "Twin Cities" can actually be taken more than one way, depending on who is watching and the state of their concentration. That sounds all right and well, thoughtful and ambitious. Except, it really isn't because I don't feel that was David Ash's intention. Although I believe Mr. Ash wanted to tell a story that jumps around, I don't think he wanted it to be the ultimate exercise in concentration. Reaching for the sky is an amazing thing until you realize you're not "quite" tall enough. The real question remaining is if you were elevated enough to consider this a good film. The answer? Yes. "Twin Cities" is good enough to hold it's head up high. Just not quite good enough to rocket to the moon. Let's sum things up. An egotistical husband? Check. An emotionally failing wife who is also pregnant? Check. A family disconnect and a cancer diagnosis. All present. These are the bullets of the story. Husband finds out he has cancer. He tries to "better" his life and fix his relationship(s) and finally, after going through what feels like the entire film, things change. They change a lot. Here's where "Twin Cities" attempts to be different. And different it becomes. I'm really not going to tell you the rest because put simply, I think ruining the "change in pace" would do a disservice to the film. The entire story hinges on surprise. You're just going to have to watch for yourself. For an indie film with a low budget, "Twin Cities" has a fairly large cast of talent moving the plot forward. We get to know John (Clarence Wethern) and his wife Emily (Bethany Ford) as they struggle through common relationship pitfalls. Anyone who has ever been in a long term relationship, or a long term marriage, will know just what I'm talking about. Relationships take work. That's for sure. Our two actors manage to showcase some excellent chops. These characters are quirky, different and totally done well. Complimenting this experienced couple are a slew of excellent supporting cast members. Writing each one would require another complete review, so let us keep things simple and less winded. Never in the film did things come across as scripted, cheesy or hollow. The cast breathe the life into this production. Of that I'm certain. It could have went the other way completely. I'm glad it didn't. Things on the production level remained on the up and up as well. I was impressed by the the level of quality contained in this indie film. Shots were well framed and lit. Dialog was crisp and aside from some slight sluggishness near the end, everything is held together nicely. 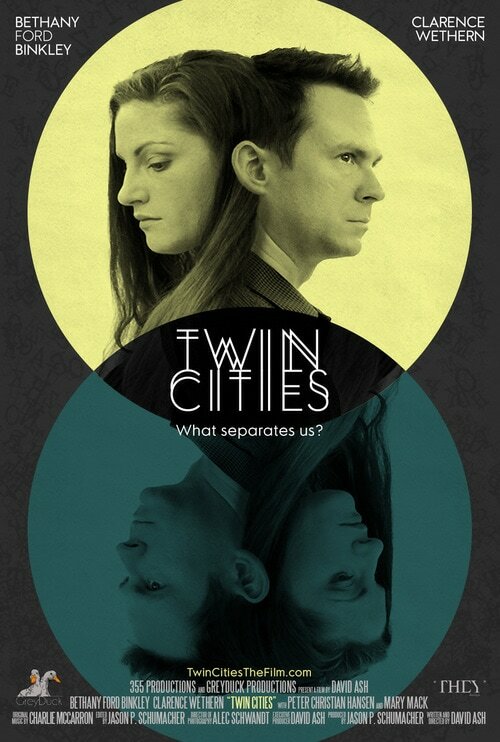 "Twin Cities" looks like a film with a far bigger budget than it probably had. That's just fine with me. So what are my overall thoughts on this ambitious production? First and foremost, points had to be given for trying something new. Throwing the "norm" into the wind. It would have been so easy to keep things simple and predictable. The fact David Ash decided to use the normality of film today, concept wise, as a crutch to lure in unsuspecting viewers before blasting them with huge changes; is completely and utterly commendable on every level. Many reasonably budgeted films would never do that, and we all know how Hollywood operates. Did it work completely? Well. Not completely. But that's not enough to make this a bad film. It worked enough to keep things interesting and entertaining. It's easy to imagine some viewers may get lost along the way. That's OK as well. It'll just give them another reason to watch again. I humbly submit my rating of three out of five. Easily earning a spot above the average mark. Job well done to the cast, crew and Davis Ash himself. It was a pleasure.